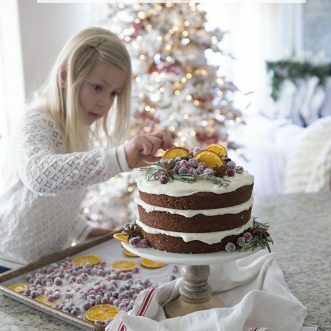 My sweet girl and I made this yummy gingerbread cake with cream cheese frosting a couple weeks ago when I shared pictures of our Christmas kitchen, and I am finally posting the recipe today! It was our favorite little recipe together so far this season, but to be fair we haven’t made our gingerbread and sugar cookies yet with all of the fun sprinkles. 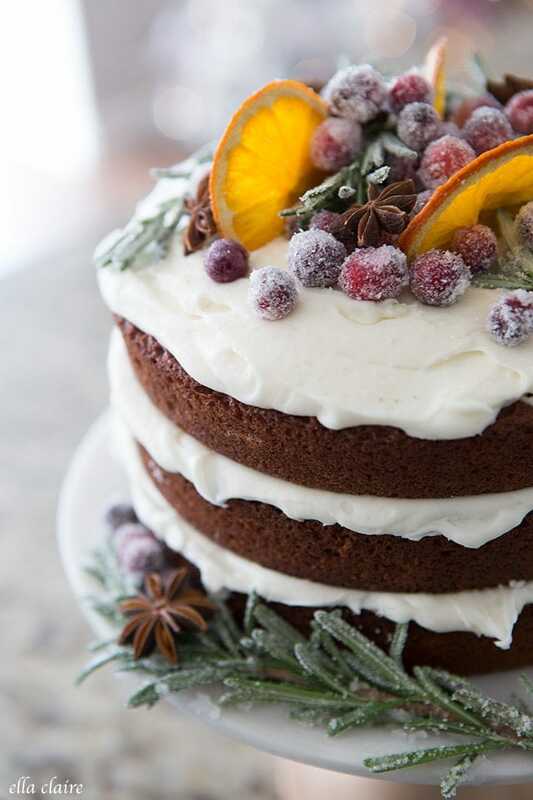 🙂 This gingerbread cake is absolutely delicious and so easy to make! I whipped it up in no time and didn’t even bother frosting it perfectly at all. 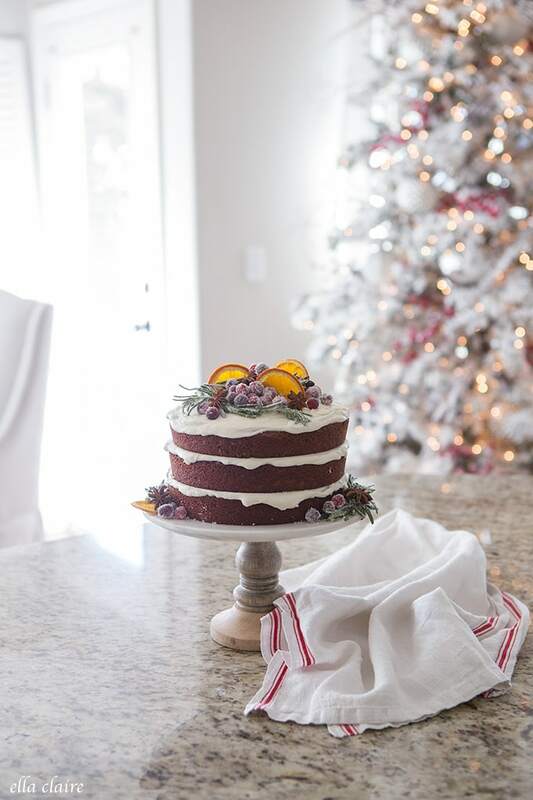 I think it is fun to make cakes look a little more “rustic” or “naked.” This cake is dense and flavorful and the frosting is creamy and delicious so it holds together well all on its own and doesn’t require a lot of fuss. 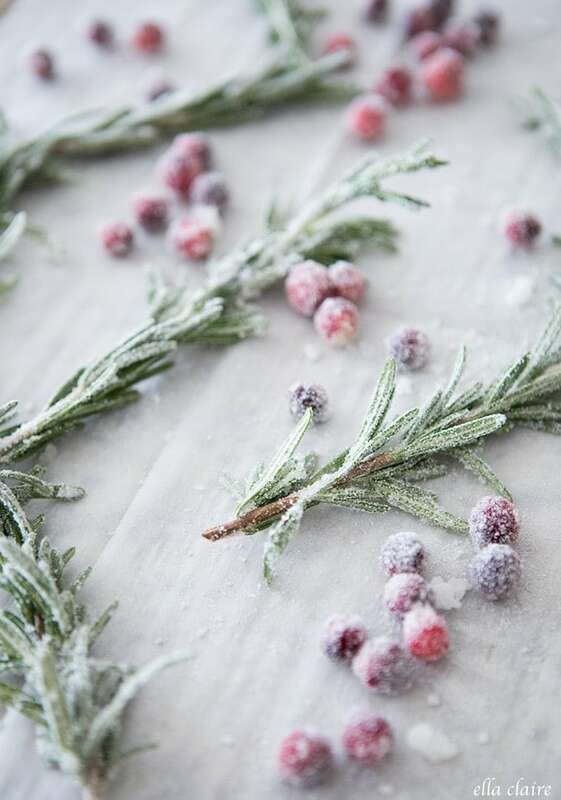 For the top of our little Christmas gingerbread cake, I made sugared rosemary sprigs and cranberries (super easy recipe HERE). I also dried a couple of oranges in the oven and found Star Anise at the grocery store. 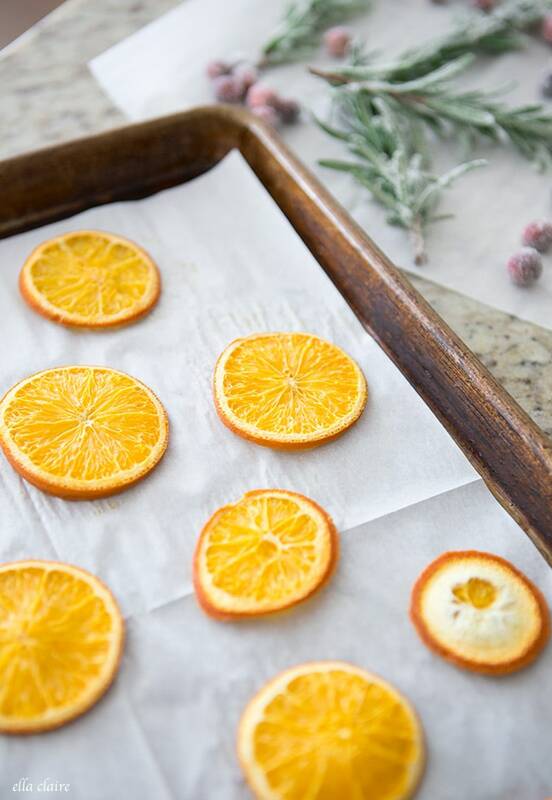 Tip: to dry oranges, slice thinly and blot both sides of slices with a paper towel to remove excess juice. Place on a parchment lined cookie sheet and bake in a 200 degree oven until peels are dry- approximately 2 to 2 1/2 hrs. Flip slices every 30 minutes or so while baking. My sweetie helped me to get the top decorated just right. I love her love of doing creative things. Preheat oven to 350 degrees. Combine flour, spices, and baking powder in a bowl and set aside. In separate bowl, blend molasses, oil and boiling water and set aside. In a mixing bowl, beat butter until fluffy- 1-2 minutes. Add sugars and mix well. Add eggs one at a time. Alternate adding the flour mixture and the wet molasses mixture to the butter mixture, beginning and ending with the flour mixture. Scrape sides and bottom of bowl and mix until ingredients are well combined. Pour cake batter into three 8″ greased and floured cake pans. Bake for 30 minutes or until toothpick comes out clean (or with just a few crumbles on it). 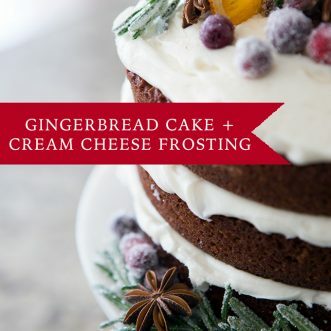 For cream cheese frosting, whip butter and cream cheese together in mixer until smooth. Alternate adding powdered sugar and milk until well combined and nice and creamy. Add vanilla. 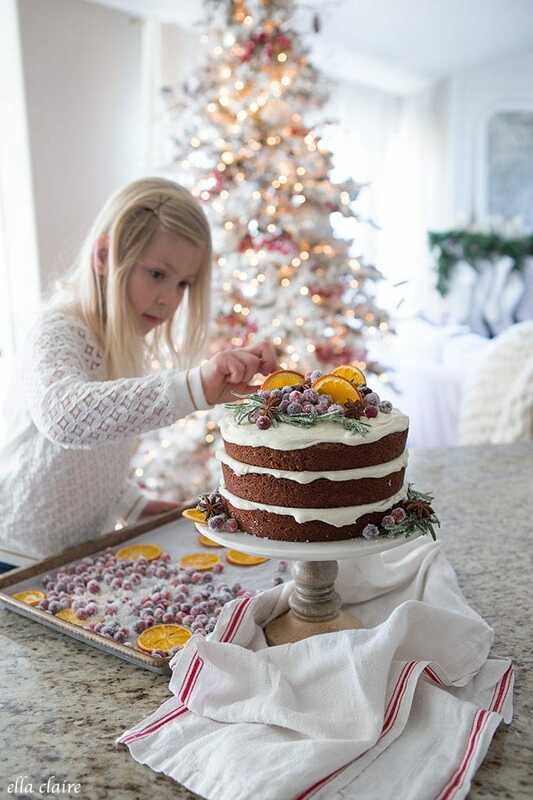 To assemble cake, place first layer on a cake stand. There is no need to cut the tops of your cake layers to create a flat surface. The cake itself is more on the dense side, so the cakes are flatter already and are perfect for the rustic cake we are making. Add a big dollop of frosting on the first layer of cake and be sure to spread it out to the edges. Place the second layer on top of the frosted first layer and repeat until all layers are on the cake. 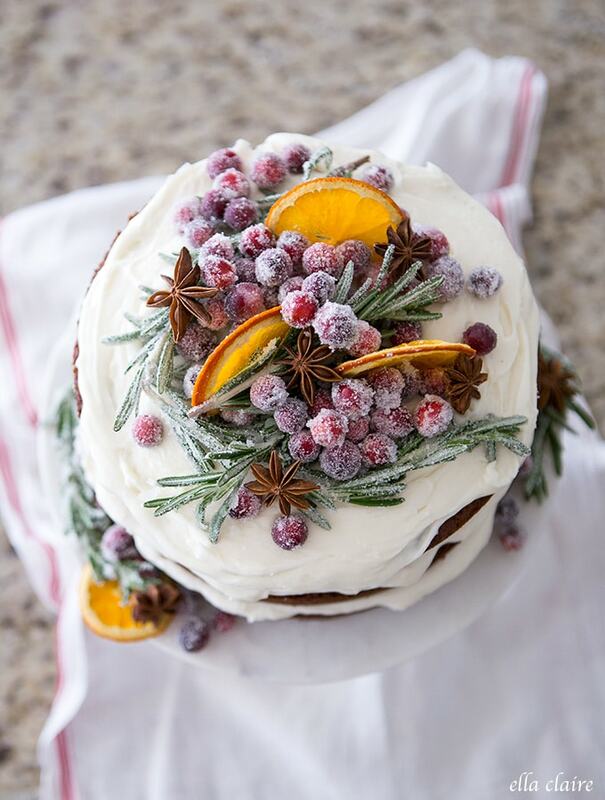 Dump a generous amount of frosting on the top of the cake and spread it in a circular motion toward the edge of the cake. Garnish as desired. Hi you mentioned in your recipe it calls for 2/4 cup salted butter, softened. Did you mean 1/2 cup or 1/4 cup? Also for the cream cheese frosting use unsalted butter. Thank you! I really want to bake this cake this weekend for my son’s birthday! I haven’t ever frozen it, but I would think it would be fine! You will have to let me know! Made this cake for a family Christmas party. It is easy, yummy, AND pretty! Making another one now for Christmas Eve dinner. Thanks for sharing– I highly recommend!